Live Fearless. Have Fun. Vault High. Thanks for visiting my page! I'd like to thank you for your continued support of my wild journey! Live Fearless. Have Fun. Vault High. Born in Daytona Beach, FL, Jordan attended Oconee County H.S. in Watkinsville, GA before Kansas University, where he earned a degree in Sport Management with a minor in Business and a Master's in Sport Management. While competing for the Jayhawks, Scott claimed seven Big 12 titles and the 2010 Outdoor NCAA Championship. 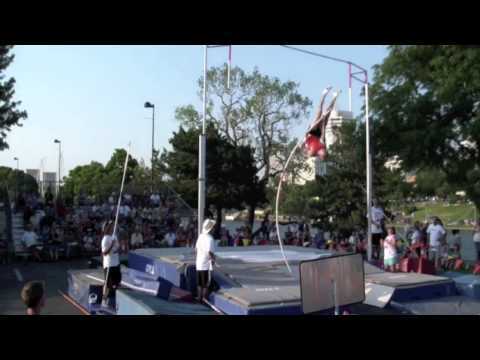 Vaulting as a professional in 2013, Jordan took the USA Indoor Championship. Check out Tish & Snooky’s Manic Panic Hair Dye! While his abilities in the field are certainly worth noting, Jordan is best known for his choice of hairstyles. While vaulting for Kansas, he began to dye his hair for each competition, and has been doing it ever since. Off the track, Jordan is just as diverse. On top of working full-time in I.T. for Kansas Athletics, he also repairs Apple devices and is a part-time Graphic Designer for Coffee News. When not training, competing, or working, Jordan spends his leisure time hunting, bowling, and woodturning. Above all, Jordan knows to have fun, and loves doing so with the woman he has dubbed the sexiest on the planet, his wife.